Want to significantly reduce the cost of your heating and cooling bills? Ask about the benefits of geothermal heating and cooling installation by Service Professor. Our trained technicians also service geothermal systems. There are many options for heating your home and geothermal heating is one of the high-efficiency methods. Geothermal heat pumps are eco-friendly, highly efficient heating and cooling systems. They provide both heating and cooling options for your home. A geothermal system is built with a long loop of underground pipes filled with either water or an antifreeze solution. These pipes are then hooked into a geothermal heat pump located in your house. This pump acts as both a furnace for heating your home in winter or as an air conditioner for cooling in summer. It transfers the heat from the ground to your house and vice versa. Some models can also provide you with hot water. Geothermal Heating: When providing heat, the liquid in the system pulls heat from the ground and takes it to the geothermal unit and then the refrigerant coils. The heat is then distributed through an indoor air handler system – a forced air or hydronic system. Geothermal Cooling: During cooling, the process runs the reverse to heating. The pump removes the heat from your home to the earth. Want to know if geothermal heat pumps are right for you? Let our technicians review your options and see if your yard is suitable for a geothermal heating system. It’s Quiet: Geothermal heat pumps do not require an outdoor condenser. Because of this, they are quiet when operating and eliminate the noise from regular pump condensers. It Lasts Long: With routine and ongoing maintenance, the underground loop field of your geothermal heating system can last up to 50 years. And your indoor air handler can last up to 25 years. Maintenance is key, however, for you achieve this. Energy Efficient: Compared to other heat pumps, geothermal heating is one of the most energy-efficient methods of heating your home or office. At Service Professor, we make it easy and affordable to own a geothermal heating system. Because of the high amount of energy savings you can reap from geothermal heating, the upfront cost of installation can be a bit steep. 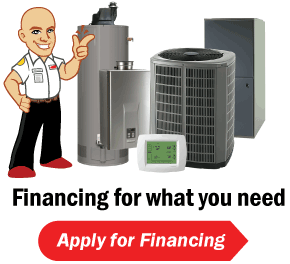 But, Service Professor can help you access financing options so that you can get your geothermal heating system installed. Service Professor offers fast and easy geothermal heat pump installation for homeowners across West Michigan. Whether you need a new installation or to retrofit your current home, our technicians can handle it for you. You can choose to have us do occasional maintenance. But routine maintenance is ideal if you want to ensure that you get the best out of your geothermal system. You should consider joining our Service Professor Protection Plans to extend the life of your geothermal heating system. You get priority maintenance scheduling and routine services to ensure that your geothermal HVAC system works properly and keeps you comfortable. Our knowledgeable technicians are available 24/7 for your emergency heating and cooling needs. Simply give us a call at 616-871-1900616-871-1900 to schedule a fast response from our team of geothermal heating experts. Looking for a new geothermal system installation, HVAC repairs, or maintenance services? Look no further than Service Professor, your experienced geothermal heating system experts. We offer geothermal installations for Grand Rapids residents as well as homeowners throughout other cities in West Michigan. To learn more about a geothermal heating system or to schedule a visit to get a quote, call Service Professor at 616-871-1900616-871-1900.